Shirts With Random Triangles: Kliff Kingsbury and Nelly? Kliff Kingsbury and Nelly. Kliff Kingsbury and Nelly? Kliff Kingsbury and Nelly. 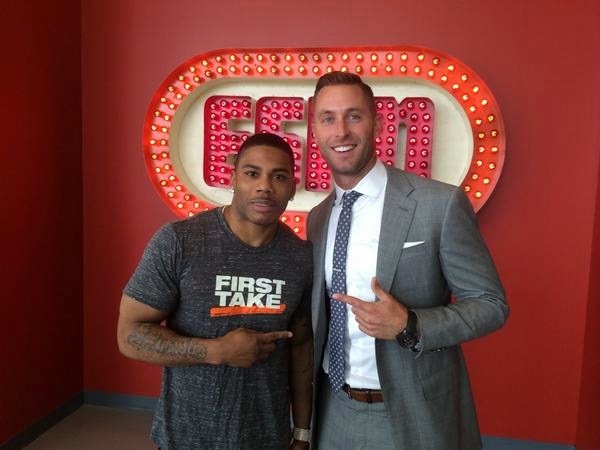 From the "Incredibly charismatic and relevant college football coach meets formerly relevant rapper" department comes this photo of Texas Tech head coach Kliff Kingsbury with rapper Nelly at ESPN. It was tweeted out by Texas Tech associate athletics director of communications Blayne Beal. No word as why Nelly is at ESPN. His next project is apparently a supporting role in the film Reach Me, which stars Sylvester Stallone, Kyra Sedgwick, and Thomas Jane. It's set for release in October. Charlie Weis and Nelly? Charlie Weis and Nelly. Nick Marshall is an ex-SEC Media Days attendee. Alabama DL Jarran Reed arrested on DUI charges.